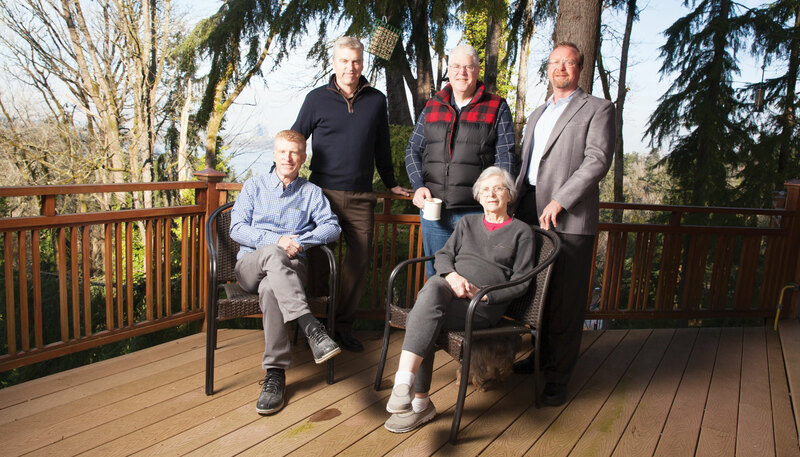 FLYING HIGH: Eric Mills, seated left, Ed Mills, standing left, and Fred Mills, center, with their mom, Marian Mills, who introduced the brothers to bird-watching, and Global Harvest Foods CEO Dave Whitley, a relative newcomer to the hobby. When Dave Whitley became president and CEO of Tukwila-based Global Harvest Foods nearly six years ago, he had never fed a bird in his life. Since he was now running a bird food company, he started using its birdseed and bird feeders at home to see what the experience was like. Soon enough, he was spotting northern flickers in his yard. That’s the experience Global Harvest likes to bring to people. Bird-watching is second to gardening among the most popular outdoor activities in the United States, according to the company’s own research and the Wild Bird Feeding Industry trade association. And depending on how you slice it, Global Harvest Foods is the No. 1 or No. 2 birdseed manufacturer in the world, measured by revenue and pounds produced. “It’s kind of this quiet industry that no one ever thinks about,” Whitley says. Global Harvest continues to grow on all fronts, developing better bird feeders, acquiring bird food producers and retailers, and bringing more grain farmers on board. In 2014, it acquired the U.S. wild bird food business of the Scotts Miracle-Gro Company. In 2016, it acquired some of the assets of Wild Bird Centers of America. With products selling under the Audubon Friends, Audubon Park, Morning Song and Songbird Selections brands, Global Harvest takes a “Swiss Army knife” approach to growth, investing in expansion as well as trying to grow its customer base by offering low-priced birdseed options and new kinds of feeders that make it easier to feed birds at home. Swimming against a consumerist current hastened by the proliferation of personal electronic devices, habitat destruction and climate change, the company remains determined to persuade Americans to use bird feeders and learn the joy of watching wild birds. Three brothers from Spokane started Global Harvest. The eldest, Fred Mills, founded the business in 1982 when he was trading commodity grains from the basement of his parents’ house. Customers in China used the grains to mix into birdseed. Fred had built relationships that enabled him to begin bagging his own grains domestically. Middle brother Eric Mills was working at Seafirst Bank but soon decided to join Fred’s fledgling operation. By 1984, youngest brother Ed Mills came on board after working in cost accounting and production control. In the early 1990s, supermarkets began asking the company to bag bird food for them. Global Harvest turned to the Audubon Society, the Cornell University Lab of Ornithology, and its own trial and error to formulate successful blends offering the best nutrition profiles. Eventually, the bird food business eclipsed grain sales. Global Harvest now sells regional mixes based on its own testing as well as on research by its partners. With a corporate headquarters on the Green River and seven other locations nationwide, Global Harvest employs 275 people. By strategically placing facilities across the country — from Mead, Washington, just north of Spokane, to Allentown, Pennsylvania — Global Harvest has plants situated near growers to keep transportation costs down. The company sources directly from farmers for most of its seed, Whitley notes, making the operation cost effective and competitive. Its cross-country footprint also sets it apart from competitors, which typically tend to be corporate conglomerates based in the Midwest. Global Harvest now sells in Costco stores and more than 100 other retail businesses, from pet shops and specialty stores to supermarkets and hardware stores. The company provides the Audubon Park brand to Costco and produces private-label brands for Fred Meyer, Safeway and Kroger. It produces hundreds of millions of pounds of seed a year — a 50 percent increase in the past five years. Whitley attributes the growth to market-share gains, product expansion, acquisitions and increased production capacity. Global Harvest ranks second behind Central Garden & Pet Company — a $2 billion public corporation — in global bird food sales, but not by much. And Whitley says if Central Garden & Pet’s two divisions, Pennington and Kaytee, are ranked individually, then Global Harvest becomes No. 1. The company also has a special relationship with its growers and suppliers, allowing them to flourish together. One of the crops the firm is most excited about is black oil sunflower seed. Global Harvest is working with about a couple of dozen farmers in the Spokane area to grow a collective 4,000 acres of sunflowers. Dennis Urbat, a farmer in Deer Park, north of Spokane, is one of those growers. He was supplying Global Harvest with barley and wheat when, about seven years ago, he started experimenting with sunflowers. He began with 40 acres. They thrived, so he expanded to 100 acres, then 250. Today, he grows 250 acres for his own business and more than 500 acres for other farmers. Other regional farmers are following suit. “I’ve got a market that I can grow for and that’s what I cater to,” Urbat says. The sunflower field is now something that brings passing drivers to a screeching halt to take photos, he adds. Several years ago, when he was selling barley and wheat to Global, it used a broker and didn’t buy directly from him. He suggested Global Harvest acquire a grain dealer’s license so it could deal directly with the growers. The company took the advice, enabling it to save money. It passed the saving to Urbat. Bulldog Bag, in Richmond, British Columbia, has supplied Global Harvest with zipper bags, lamination materials and roll stock for about 25 years. Global Harvest is one of its biggest clients. Brian Mielke, an account manager for Bulldog Bag, says both companies have grown in tandem. Mills feels that same sense of commitment to birds. As human-generated development continues to destroy the natural habitat of wild birds, the animals rely more heavily on what humans can provide. When people install feeders in their backyards, it helps create a feeding corridor for migrating as well as resident birds. Global Harvest hopes future generations of consumers continue to embrace the practice. “We’re in the business of connecting people with nature,” Whitley says. Toward that end, Global Harvest has entered the early stage of assessing whether climate change will affect its business, taking note, for example, that the Pacific Northwest now sees hummingbirds year-round and that other bird species are changing their migration patterns. But ask Whitley about the greatest threat to the birdseed industry and he doesn’t mention habitat destruction or climate change. He points to his cellphone. “People don’t care about nature anymore,” he laments.